Stay warm and stylish during the cooler months with Mango’s Mummy Coat. Made from a wool blend material, the black and white checked coat has a camp collar and two flap pockets at the side. Cut for a slightly loose fit, it’s the perfect coat to rent for a work function or for date night! Balance the coat’s oversized silhouette by wearing it over a black playsuit and black ankle boots. Inject some colour to your look by hiring a pink crossbody bag. Read our blog post for tips on how to wear playsuits during winter! Mango is a world-renowned fashion brand established in Barcelona in 1984. Created by brothers Isaac and Nahman Andic, Mango comprises of collections where urban womenswear following the latest fashion trends are offered at reasonable price points without sacrificing quality. One of Spain’s leading fashion labels, Mango has over 1,220 stores in more than 90 countries. With pieces designed for the daily lifestyle of the modern and urban woman, Mango currently has four lines within its womenswear range: sportswear, casual wear, jeans, and suits. From sharp and tailored suits and black A-line midis for the office to sequin party dresses and elegant jumpsuits for cocktail hour, there is something from Mango’s diverse collections to suit anyone’s taste and personality. Read our blog post for our cocktail event style guide! 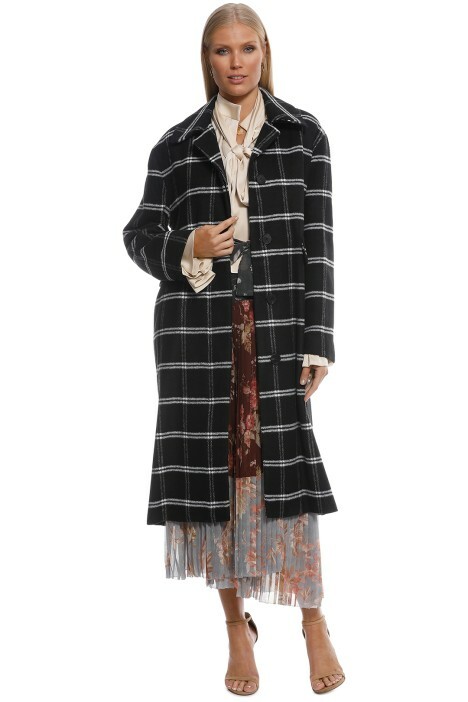 LENGTH: This coat is midi length. UNDERGARMENTS: Suitable with any undergarment.